I think my eyes might not be working properly. The page says that there is a new awesome podcast but it hasn't been a month since the last one yet. Maybe JRY was right that the government would start charging for me to use my eyeballs and I just missed a payment. There's one thing that wasn't mentioned in the zombie scenario that I'm curious about. 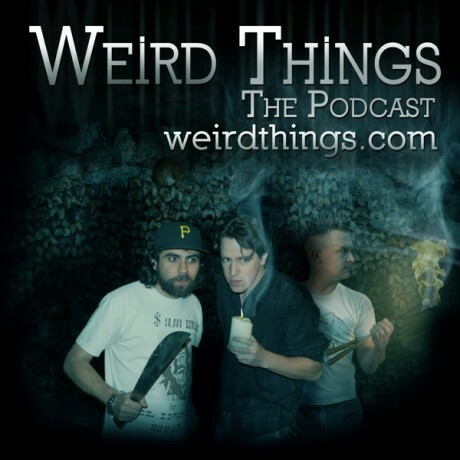 Would you still continue making a Weird Things Podcast together during the zombie apokalypse? Or at least a few episodes of the podcast before Justin and Andrew get sick of Brian constantly bringing up the devouring of his family or trying to steer the conversation towards the brainstorming of new identities. Or maybe Andrew and Brian would get tired of Justin always bragging about how much of human civilization he and his army of the undead have destroyed this week. Or maybe Andrew is just too busy stealing Brian's latest car and cruising around town, in search of potential mates, to be bothered with a podcast. That is a terrific question worthy of another podcast. Andrew why do you let those ruffians and hooligans aka JRY and B-Wood push you around and just generally hog the podcasting spotlight ?? Stand up to these bullying weaselish dorkmeisters and reclaim your rightful place as the magical King of the Weird Things podcast !!! Long live King Andrew !!! Yay !! I wish you were the Michael Hogan in the new Battlestar Galactica. I just wish that I got his salary, maybe the post office will mess up and I will get really lucky. oh shush you say !!! Good point and yet I can't help but feel King Andrew will have something to say about this !!! Unless he has been in the cider again then we won't hear from him for many days, curse you cider and your sweet seductive ways !!!! Thanks. I look forward to hearing the responce to the question on a podcast.